Never has ‘from death comes new life’ been this literal. 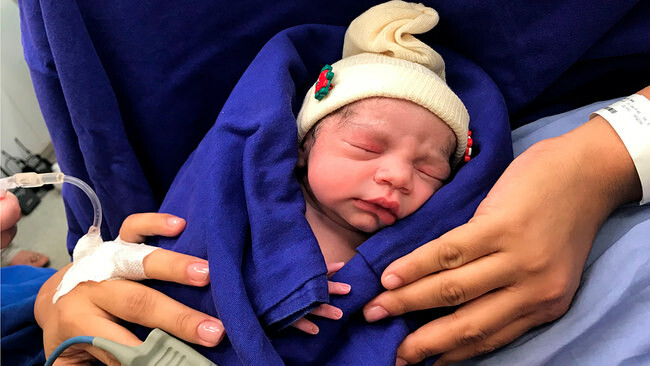 A baby girl in Brazil has become the first child born to a mother who carried her in a uterus transplanted from a dead woman. The 32-year-old mum gave birth to her biological daughter in December 2017 after undergoing uterine transplantation surgery from a dead donor, the first successful procedure of its kind in the world, Brazilian obstetrician and transplant specialists reported in medical journal The Lancet on Wednesday. Uterine transplantation is very rare and has only previously been successful when a family member or friend is willing to donate her uterus to a would-be mother. The first live birth from a uterine transplantation using a living donor was a medical milestone in Sweden in 2014. There have been a total of 39 live donor transplants, resulting in 11 live births in the past five years. Ten deceased donor uterus transplants had been attempted and failed in the US, Czech Republic and Turkey. This successful case may offer women with uterine infertility a greater chance to carry and give birth to a baby without the risk of major surgery for live donors, the Lancet case study authors at the University of Sao Paulo Faculty of Medicine Clinics Hospital wrote. The baby girl’s mother was born without a uterus as a result of Mayer-Rokitansky-Kuster-Hauser syndrome a rare disorder that affects a woman’s reproductive system. Four months before her transplant surgery she underwent an IVF cycle which resulted in eight embryos. The donor was a 45 year old woman who died of sub-arachnoid haemorrhage (a type of stroke). She was a mother herself, having given birth to two children. Her uterus was removed and transplanted into the 32-year-old during a complex surgery that lasted 10 and a half hours. The procedure involved connecting the donor uterus to the veins, arteries, ligaments and vaginal canals of the 32-year-old. She was given five immuno-suppressant drugs -which she took throughout her pregnancy – antibiotics and anti-blood clotting treatment. Five months after the transplant her body showed no signs of rejecting the uterus and her fertilised eggs were implanted two months later. Previous live donor transplantation have waited at least a year before attempting a pregnancy. Her baby girl was born via a caesarean section at 35 weeks and three days gestation, and transplanted uterus was removed during the c-section. The newborn weighed just over 2 kilograms. Mother and baby were discharged from hospital three days later. The case was proof-of-concept that deceased donor uterine transplantation was “a new option for women with uterine infertility” lead researcher and gynaecologist Dr Dani Ejzenberg said. The current need for live donors “is a major limitation as donors are rare, typically being willing and eligible family members or close friends,” Dr Ejzenberg said. The group of women who would benefit from a uterus transplant is very small. Of the 10-15 per cent of couples with infertility problems, one in 500 women have uterine abnormalities. Professor Lois Salamonsen, research group head of endometrial remodelling and Adjunct Professor at Monash University’s Department of Obstetrics and Gynaecology said she had received a few calls form Australian women over the years asking why uterine transplantation wasn’t done in Australia. “I’d have to say it’s in the pipelines but there are easier ways to have children like finding a surrogate or adopting,” she said. She raised concerns about the unknown long term effects of the technique, particularly the fetuses’ months of exposure to immuno-suppressant drugs. The oldest child born via uterine transplant – a boy – had just had his fourth birthday. Unlike most transplantation surgeries “this is not a matter of life and death but more to satisfy a woman’s desire to carry a child,” Professor Salamonsen said. IVF Australia medical director Associate Professor Peter Illingworth said using deceased donors avoided the need for women to undergo major surgery and the risk of complications in order to donate their uterus to their loved one. But it was not a procedure Australian specialists were likely to offer any time soon. “This is a very serious operation with a high level of risk in terms of the surgery itself and managing the immuno-suppressant medication needed. An accompanying editorial in the Lancet said the procedure was in its early stages and “many questions are still unsolved” including optimal surgical techniques, drug regimen and best-suited patients.